At age 62, Ulysses Grant is bankrupted in a Wall Street swindle. His only hope to restore his honor and save his family is an offer to write his memoirs of the war. 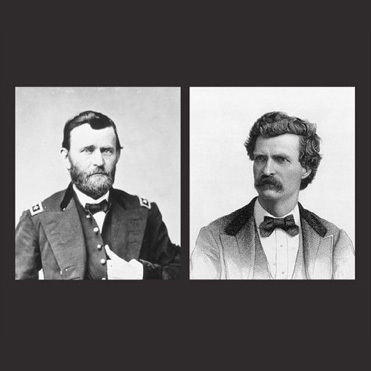 GRANT & TWAIN tells the story of a remarkable friendship. At age 62, Ulysses Grant is bankrupted in a Wall Street swindle. His only hope to restore his honor and save his family is an offer to write his memoirs of the war. News of Grant’s calamity brings his friend Mark Twain to his side. Twain is infuriated by the terms offered by the prestigious publisher. He makes an audacious proposal: he himself will publish Grant’s book and make it the biggest bestseller in American history. When Grant finally agrees, he is faced with a double enemy — he is diagnosed with terminal cancer and writes in a race with death; and he discovers an enemy close to home. Elizabeth Diggs has been a resident of Austerlitz for more than thirty years. Her plays, including “Close Ties”, “Goodbye Freddy” and “Nightingale”, have been produced at theatres nationwide, in England and Europe. She is the recipient of Guggenheim and NEA grants in playwriting as well as the Los Angeles Drama-Logue Award, the CBS/FDG Prize, and a Kennedy Center Fund for New American Plays grant. She was a runner-up and a finalist twice for the prestigious Susan Smith Blackburn Prize. She also wrote for the groundbreaking TV drama St. Elsewhere. She is Associate Professor of Dramatic Writing at Tisch School of the Arts, NYU. The cast includes several Columbia County residents — Stephen Lang as Grant, Emily McCully as Julia Grant and Nicholas Haylett as Grant’s War Secretary, Adam Badeau. Robert Zukerman and Brad Lohrenz are Production Assistants. Two New York City actors, Dion Graham and Eric Conger, join the ensemble and Ihor Shuhan, a student at Simon’s Rock, will play the role of a young Union soldier.